I’ve always heard that most accidents happen close to your home, within 5 miles of your house. Last night I was two blocks away from my apartment, fumbling to find my keys for our front door, when a man took a swing at me. I was listening to my headphones and not paying attention to him or his increasing proximity. Instead of whatever he yelled at me, I heard M83’s apocalyptic drums. I looked down at my shoes and ducked. He missed my head by a wide margin, his aim so poor that I wondered if he meant to hit me or scare me. His friend, who I hadn’t noticed watching us, just laughed. I couldn’t hear him, but I saw his teeth. I walked away. I should have ran or said something to them, but I just walked. I could barely register what had happened. I sat down on the couch and put my head in my hands. I realized I wasn’t breathing. I sucked in, but it didn’t feel like a breath. Earlier that day I told my grandmother over the phone I would be walking home that night. My gym was closed for Memorial Day, and I figured the distance between Lincoln Square and Rogers Park would make up for it. 3.5 miles, each way. My Nana told me to call her the next morning to tell her I was okay. She always tells me to do this when I’m out late and walking alone. She worries, so much so that it keeps her up at night. I’ve always told her she has nothing to worry about—because I have privilege in the matter of street harassment. I have trans friends who have to experience transphobic attacks—usually verbal, sometimes more physical—just for riding the train. As a male-bodied person, I can walk to my local cafe without having a guy scream at me from his car, who thinks that I should take lewd objectification as a compliment. Most days I’m allowed to be myself without anyone saying anything about it. I often brag to her about how “safe” I feel. That man—later identified as Elliott Morales—shot and killed Carson. Reports indicate that when police apprehended him, Morales “laughed and bragged” about the killing. Because Carson’s murder happened in the West Village, the historic haven for New York’s queers and artists, the gay media quickly latched onto the crime. Because this isn’t where we think crime happens. 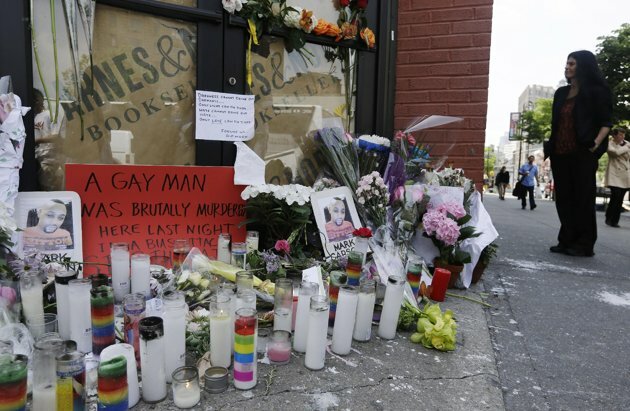 Hate crimes don’t happen next to the Stonewall Inn. They don’t happen in the gay-friendly Hell’s Kitchen, where it’s not uncommon to see men arm-in-arm or two women kissing on the sidewalk. This is where activist Eugene Lovendusky was attacked on Friday. Lovendusky was punched in the jaw as assailants yelled “f*ggot” at him. He is hate crime victim 22 in New York this year, one of a half dozen this month alone. It happened in Union Square, on 33rd Street. On May 5, Nick Porto and Kevin Atkins were attacked by four Knicks fans outside of Madison Square Garden. They threw Atkins and Porto to the ground while repeatedly kicking them. Atkins left with a broken nose and Porto a fractured wrist. Atkins and Porto told police officers their assailaints shouted anti-gay slurs at them; they called them “f*ggots,” just like Lovendusky. Despite this language, the police told reporters it was “too early to call it a hate crime,” labeling it a “possible bias attack.” The pair were attacked while holding hands. Statistics show that queer people are more likely than any other group to be victims of a violent crime, and across the country hate crime numbers are on the rise. According to statistics from Orange County police, their LGBT hate crime numbers have doubled in the past year, despite “general downward trends” in hate crimes overall. The same is true in New York, where LGBT hate crimes are up 70 percent while overall numbers plummet. 2011 numbers showed that hate crime rates against queer people were the highest in history, but 2013 is well on its way to topping that. However, these numbers are likely inaccurate, as police often discount or play down sexual orientation and gender identity in crime reports. In April, a Sonoma Valley student was knocked off his skateboard by seven teens who taunted him while they wailed on his prostrate body. They robbed him and left him there. The 18-year-old teenager was vocally out in his high school, which was known to the assailants. Despite their repeated use of slurs, police labeled it a “fight,” implicitly blaming him for being beaten. "Fight" indicates two parties are at fault. When the teenager pleaded with them to listen to his story, police told him “what colors not to wear, not to ride a skateboard, and stay away from the neighborhood because it was gang ‘turf.’” This is like blaming a woman for being harassed because she was “wearing a short skirt.” This says he invited violence in for being himself. The teenager’s mother, Kristin Land, had to demand an apology from local police to get them to recognize the crime for what it was: hate. Although police mishandling has been crucial in underreporting the hate crime wave, the media has also dropped the ball on homophobia. According to Media Matters, which tracks statistics on news coverage, Fox News didn’t cover the Carson story. CNN mentioned it all of once, devoting its coverage instead to the Jodi Arias trial. Mark Carson got 50 seconds. Even liberal, gay-agenda-lovin’ MSNBC has aired five times the amount of coverage on Arias as they have on Carson. Carson is only the tip of the iceberg. Queer people are murdered every day without the mainstream media raising much of a fuss. Where was the outrage for Paige Clay, Tiffany Gooden, Lawrence Peterson, Courtney Bright, Patricia Mashigo, Joseph Ulrich, Brandy Martell, Victoria White, Larry King, Tyli&apos;a Mack, Destiny Lauren or Sanesha Stewart? When the Cleveland Plain-Dealer reported the murder of transgender Cemia Acoff, they referred to her dead body (which was “stabbed, tied with a piece of rope attached to a block of concrete and dumped into a pond”) as “it.” If hate crimes work to take peoples&apos; power away, this dehumanization only furthers the cause. At a time when marriage equality pushes across the country, Southern Poverty Law Center’s Mark Potok believes this “desperate anger” against LGBTQ people is “ratcheting up in direct proportion to the losses that the religious right has suffered.” Hate crimes against Latinos and Muslims skyrocketed through the aughties, as September 11 and immigration became some of the defining issues of the decade. In France this week, violence broke out as 150,000 protesters stormed the capitol ahead of the country’s first same-gender marriages, set to take place on Wednesday in Montpellier. Marriage opponents threw bombs and rocks at police and attacked two journalists. These protests were backed by the country’s Roman Catholic church. Similar rallies have been mounted in Chicago to oppose the passing of state marriage legislation, which may come up for a vote this week. Even Mark Carson&apos;s funeral got protested. While marriage equality gets all the media coverage (because it’s the nice version where It Gets Better), this shows there’s more to the story; there’s a dark side to equality. We miss what people like Cemia Acoff and Mark Carson died for -- the culture of ignorance and dehumanization that allows us to decide that others are less than us and don’t deserve basic human rights. If Potok is right, we need to start taking these cases of violence seriously—because our hate crime wave is far from over. Should Illinois pass equal marriage this week, we’ll only be the 13th state to celebrate equality. There are 37 more states to go. That’s a lot of desperate anger ahead. However, marriage won’t win the war. It doesn&apos;t stop discrimination or slap the gun out of Elliot Morales’ hand. Marriage can&apos;t light up the dark while I walk home. Equality is more than legalizing love. It’s about protecting humanity. When I talk to my grandmother, I don’t plan to tell her the world is safe. But that doesn’t mean we can’t fight for it.